Rose hips from the kitchen garden. The native wild rose of the hedgerow is known by many names, most notably the dog rose (Rosa canina). Once autumn arrives, the orange and red hues of rose hips become more noticeable as the last rose petals drop and their leaves fade. Kitchen garden blog. Rose hips heart. There are many uses of rose hips – not least they make for a beneficial natural food in the wildlife garden for birds, squirrels, deer, rabbits and mice. Even horses and ponies will contentedly munch on rose hips that grow around their fields. But humans can make use of the benefits from rose hips too - all sorts of home remedies and herbal cures are believed possible, including bringing health to the heart. 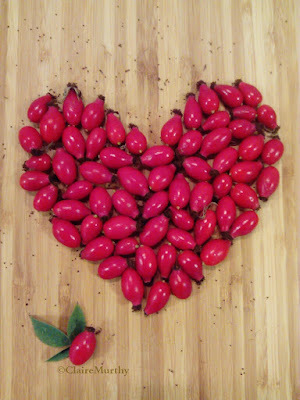 Roses and rose hips are as much loved too for their beauty - so a rose hip heart sums up this favourite garden flower. A handful of rose hips were gathered with the intention of making rose hip syrup to ward off winter colds but their striking colour and pleasing smooth shapes invited a few minutes of rose hip art and crafts. Other ways of using rose hips in crafts will be included in this kitchen garden blog later. There are also several rose hips in vases, ready to be turned into botanical watercolour paintings. Another handful of wild rose hips will be picked for the kitchen but there will be plenty of this natural food left in the garden for the wildlife and birds. Rose hip syrup will find its place on a shelf in the cupboard again this year - but it won't last through the winter as it is just too tasty to leave it alone!